Our research laboratory at Duke (joint with my husband Dave Richardson) studies the 3-dimensional structures of biological molecules such as proteins, nucleic acids, and their functional associations with each other. Those are the tiny machines that do almost all the work in our bodies, and are the targets of most drugs. Because the molecules are very much smaller than the wavelength of visible light, this research requires model-building with the data from high-tech tools such as synchrotron X-ray sources, big computers, big data, and now cryo-electron microscopy. However, we have often made breakthroughs initiated by a concept from the humanities, especially the visual arts. This piece tells four short stories of how art has influenced our scientific research. Protein and nucleic acid (RNA and DNA) molecules are long polymers with a repeating backbone unit decorated with one of a small library of sidechains branching off from each unit. Both backbone and sidechains interact to fold up spontaneously into a compact, complicated, and biologically functional molecule in the cell or the body. Each such molecule has thousands to even millions of atoms in complex arrangements, so the detailed 3D structure of even a small one such as the Staphylococcal nuclease in Figure 1a needs interpretation and simplification to begin the process of human perception and understanding. 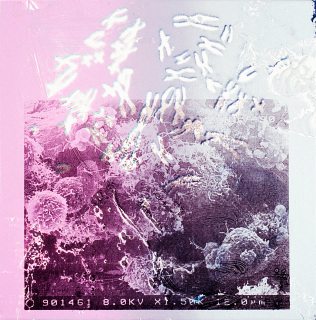 ​A first step, either for the brass models of the 1960s and 70s or for later computer-graphic atomic models, is to show a smoothed "worm" that traces along the backbone, as done in Figure 1b by shining UV light on tygon tubing filled with fluorescent dye (green for the backbone and pink for a nucleic-acid inhibitor bound at the active site). However, the structure is also specified, and held together into "secondary-structure" elements, by weaker but cooperative interactions called hydrogen bonds (dotted lines in the 4-stranded beta-sheet of Figure 1c), so that alpha-helices are really cylinders and beta-sheets are really slightly twisted sheets, not unrelated strands. ​The breakthrough to ribbon drawings was using a representation similar to the Escher drawing in Figure 2a, where continuous surfaces are shown implicitly by the spaces and the alignment between adjacent ribbons. That openness is even more important for molecules, where one needs to see through to multiple layers of structure, not just front and back surfaces. Figure 2b shows the representations I worked out for suggesting the up-and-down hydrogen-bonds between turns in alpha-helical spirals and between beta-strand arrows that twist together as multi-strand sheets. The highly varied and non-repetitive arrangements in the loops between secondary structures are simplified as smooth ropes. Figure 2c shows my favorite hand-drawn ribbon, colored with pastels, of the enzyme triose phosphate isomerase (aka TIM), which has a central, 8-stranded beta-barrel (green arrows) surrounded by a ring of 8 alpha-helices (brown spirals). The TIM backbone winds from strand to strand around the structure in a simple pattern now known to be one of the commonest protein "folds." I'm very proud that the TIM image was chosen as Picture of The Day on the English Wikipedia for November 19, 2009. Pen-and-ink drawings of the 75 distinct proteins whose structures were known by 1980 (including the two solved in our lab) were the central feature of a long article classifying both local details and overall folding patterns of protein structure (Richardson 1981). The drawings were quickly adopted for use in textbooks, and we distributed a coloring book of them. As computer graphics developed in the 1980s and 90s, other overall representations were tried, but both static and interactive computer versions gradually converged on styles quite similar to the hand-drawn ribbons. They are used in most scientific or educational articles about a protein structure. Two early protein structures our lab solved, Staphylococcal nuclease (Arnone 1971) and Cu,Zn superoxide dismutase (Richardson 1975), and the early structures of immunoglobulin domains all shared a similar topological arrangement of their beta-strands that seemed complex and irregular to us at first. Once I drew schematic diagrams of them (Figure 3a), I realized their shared feature was a Greek key pattern like those common on Greek vases (Figure 3b). 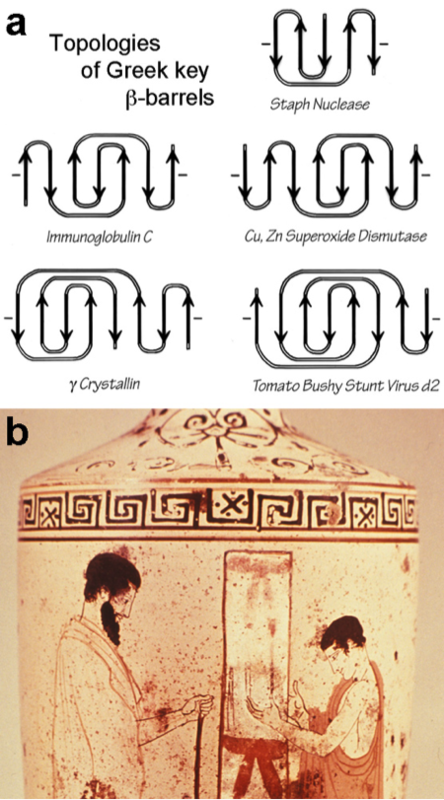 This relationship, and a similar comparison of the TIM protein in Figure 2c with Anasazi vases, was chosen as the cover image for that issue of Nature (Richardson 1977). Looking for the underlying principle, I saw it was having two beta-strands, or two painted lines, follow each other around the pattern, out from a central turn. That suggested these proteins might share a favorable structural pattern rather than being evolutionarily related, and that they may fold up from a long, twisted 2-strand ribbon with the hydrophobic sidechains on the inside of the curl (Figure 3c; Richardson 1981). For the proteins, that folding process produces a 3D "beta-barrel" such as the structure in Figure 3d, where the 2-strand ribbon is shown darkest at the central turn and lighter as it winds back and forth around the barrel all the way to the two short helices at the top of the drawing. Each paired loop that crosses from one side of the barrel to the other is called a beta-arch, and a pair of arches is called a beta-arcade. A protein like the CAP DNA-binding protein in Figure 3d, with 8 beta-strands curled in 4 pairs into a Greek key topology, is named, in a marvelously mixed metaphor, a "jellyroll Greek key." We have long thought of protein and RNA molecules as being one-dimensional (their amino-acid sequence) and 3-dimensional (their folded, active structure) at the same time. This echoes the duality of the woman's face in Picasso's painting (Figure 4a), which shows her full face and her profile at the same time. To achieve a visual representation of the molecular 1D-3D duality, we developed the technique of all-atom contact analysis (Word 1999). 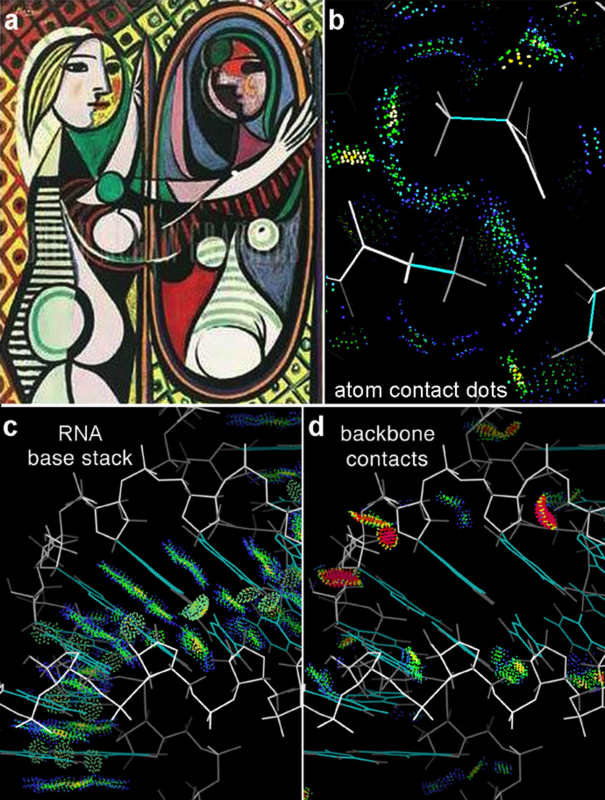 The resulting computer graphics shows color-coded dots at the surfaces where atom touch one another in 3D, while also showing the protein atoms as stick figures connected by the chemical bonds along their 1D sequence. In Figure 4b, two short sidechains make near-perfect contact (green, blue, and yellow dots) in a very accurate, high-resolution crystal structure. The sparser experimental data in lower-resolution structures can result in model errors, which usually show up in the form of red spikes for all-atom clashes where hydrogens or other atoms overlap to a physically impossible degree. Thus all-atom contact analysis is a powerful tool for identifying, and also for fixing, model problems. As an example, Figure 4c shows the extensive, favorable stacking contacts between RNA base pairs in a ribosome structure, and also the base-pair hydrogen bonds as pale-green dot pillows. RNA backbone is much harder to model accurately, and Figure 4d shows in red four bad but repairable clashes along this short stretch of backbone. This new system for showing both good and bad contacts in the context of the detailed molecular stick figures became the central feature of our MolProbity model-validation web service, now used by most structural biology researchers to improve and vet out each new structure for deposition to the worldwide database. 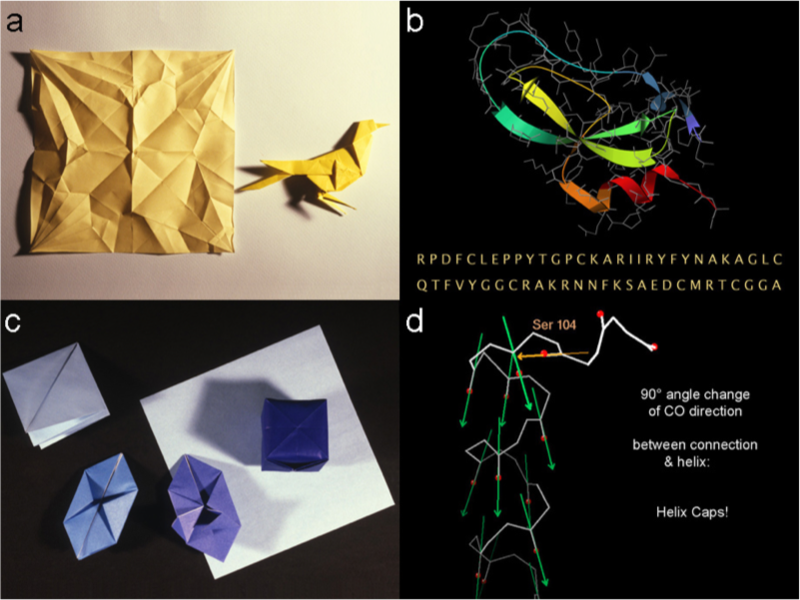 When a satellite meeting on protein folding taxed us with giving a lecture to introduce our field to the diverse scientists at the main AAAS meeting, Dave came up with origami as an analogy to help explain protein folding. At first I thought it was just a trivial play on words, but the more we explored it the more illuminating it became - eventually culminating in one of our major contributions to understanding protein structure. An origami piece (Figure 5a) starts from a generic, uninteresting sheet of paper, with its future form encoded by a mysteriously specific set of creases that, when folded, result in a recognizable and decorative object, perhaps biological such as the canary here. A protein (Figure 5b) starts from an uninteresting, floppy polypeptide chain, with its future form encoded by a mysteriously specific sequence of amino acids that can spontaneously fold up into a functional biological molecule. The canary, with 180° folds, makes a flat, 2D origami object. To make 3D origami such as a box (Figure 5c), there must be some 90° folds. In proteins, helices and sheets are approximately linear or flat, with the peptide CO groups all pointing in the same or the opposite direction. Therefore, to further understand protein folding and structure, we looked for 90° corners in the folded backbone. Indeed, we found that the backbone can change direction abruptly by using 90° adjacent CO groups (arrows in Figure 5d), leading to our definition of the very productive scientific concept of helix N-caps and C-caps which have specific shapes and sequence patterns quite different from helix interiors (Richardson & Richardson 1988). ​In summary, the art analogy gave us a critical insight toward a new direction in our science for three of these stories (all but the Picasso), and in all four cases it gave us a way of explaining the new concept to other people. ​Jane Richardson and her husband David have worked together for over 50 years on research to understand the 3D structure of protein and RNA molecules. They were early pioneers in protein crystallography, protein de novo design, and molecular graphics. They developed a method that calculates hydrogen-atom contacts to quantify the details of modeled packing interactions, widely used on their MolProbity website and elsewhere to improve the accuracy of macromolecular structures by crystallography and cryoEM. 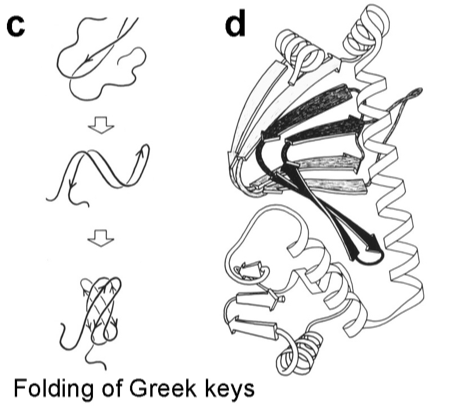 Richardson developed the ribbon representation of protein structures, described many common features of overall protein folds and local motifs (Greek key beta barrels, helix caps, etc. ), and works to spread molecular 3D literacy at Duke and around the world. From a Swarthmore B.A. in philosophy she has become a biophysicist, a MacArthur Fellow, a member of the National Academies of Sciences & of Medicine, and has three honorary degrees.